China’s media has panned the U.S. military’s Pacific pivot. But the U.S. is just fleshing out an existing strategy. With last year’s diplomatic “pivot” to the Pacific now seemingly in full swing, the United States declared the next phase of its grand shift into the Asia-Pacific. 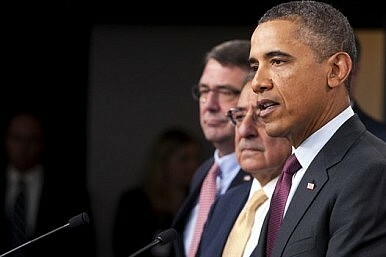 President Barack Obama, during the first press conference to be held by a U.S. president at the Pentagon, detailed America’s shift to a leaner and more cost efficient U.S. military. Such a shift, with exact details to be released in the coming defense budget, will cut U.S. combat troop numbers while investing in unmanned aerial vehicles (UAV’s) and cyber-war technology. Interestingly, it has also prompted talk that the U.S. is abandoning its policy of being able to fight two ground wars simultaneously. U.S. officials also explained where military forces would soon focus their efforts, namely the Middle East and the Asia-Pacific. Specifically, the president mentioned in a written statement, “operating in anti-access environments,” a veiled reference to Iran and China. China was quick to respond to the change in strategy, which sees U.S. forces ending their involvement in Iraq and then Afghanistan and shifting to the Pacific Rim – and China’s backyard. “The United States should learn from its past painful experiences and play a constructive role in the Asia-Pacific instead of recklessly practicing militarism. After all, might does not always make right,” it concluded. In reality, U.S. planners have been preparing a shift to the Asia-Pacific for some time now. As The Diplomat defense analyst James Holmes pointed out in a recent interview with “The Takeaway,” for example, the United States had declared in its 2007 maritime policy that “(The U.S.) should remain number one in both the Pacific and Indian Ocean regions.” The U.S. military has already moved critical nuclear attack submarines, Aegis missile defense platforms, and naval surface combatants to bases in Guam and Japan. And there’s also widespread talk of the implementation of the much-discussed “AirSea Battle Concept,” which presumably is aimed at defeating an opponent’s anti-access weaponry. Much of the United States strategy in the Pacific is based on classic conventional military deterrence. U.S. diplomats have a clear stratagey of wishing to engage China and develop close ties to lesson tensions. However, as the situation in the South China Sea remains fluid, and with the status of Taiwan still unresolved even as China’s military grows ever capable of forcing the issue, U.S. planners are being careful to hedge their bets. Contingency planning in this case is surely a good thing. The United States clearly has no interest in abandoning its growing economic or strategic interests in the Asia-Pacific. But at the same time, neither the United States nor China have much to gain by extended bouts of military brinksmanship, talk of containing one another or strategic posturing that could spark a crisis. The United States has long made clear its intentions in the region, meaning that the announcements over the military details underpinning its strategy should be seen largely as a natural extension of its existing posture. Of course, this is complicated by China’s developing anti-ship missiles with extended ranges, advanced cruise missiles, advanced naval capabilities and a military strategy of anti-access. But the United States has long advanced the view that freedom of navigation is essential for the region’s prosperity – the latest announcements are therefore only in part about China. China’s fast growing economy and increased military capabilities will undoubtedly give it greater influence in the region even as the U.S. pivots towards the Pacific. U.S. policymakers will likely hope then that China’s policymakers accept that they have guaranteed Beijing a seat at the top table of Asia-Pacific affairs and won’t feel threatened by a new containment strategy that doesn’t really exist. Healthy competition is fine, but politically charged rumblings could prove extremely unhelpful in easing tensions in a sometimes unpredictable part of the world. There’s a limit to what military-to-military forums can teach countries. The US and China are a case in point.